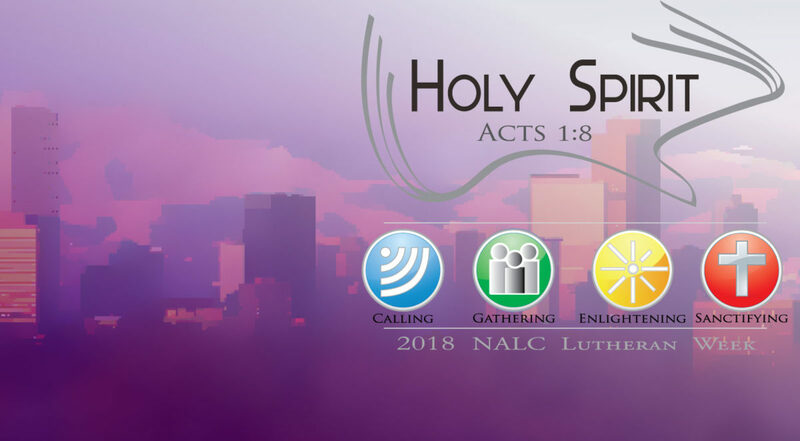 Registration is now open for the 2018 NALC Convocation and other events of Lutheran Week Aug. 13-17 at the Crowne Plaza Denver Airport Convention Center in Denver, Colo. The NALC Mission Festival and Convocation will gather Aug. 15-17 around the theme “The Holy Spirit: Calling, Gathering, Enlightening, Sanctifying.” Featured speakers for the Convocation are Sherry Weddell, author of Forming Intentional Disciples and Katherine Coolidge of the Catherine of Siena Institute. The Convocation begins with the annual Mission Festival and Mission District meetings on Wednesday afternoon and evening. Registration for the Convocation and Mission Festival is $200 and includes three meals. Events preceding the Convocation are the Braaten-Benne Lectures in Theology (Aug. 14-15), the Women of the NALC Annual Gathering (Aug. 14), the NALC Youth Leaders Symposium (Aug. 13-14) and Discipleship Coaching (Aug. 14). You may register and make hotel reservations for the Convocation and any of the other events of Lutheran Week, here. Financial assistance grants are available to assist congregations in sending a lay delegate to the 2018 NALC Convocation. The $500 grants were approved by the NALC Executive Council in response to a request by the 2017 NALC Convocation to provide assistance to congregations that might not be able to afford to send delegates to the Convocation. Congregations may seek this assistance by contacting their Mission District Dean. Recipients of the grants will be selected on June 1 and July 1 from requests received by those deadlines. “The Person of the Holy Spirit” is the theme of the Braaten-Benne Lectures in Theology on Tuesday afternoon and Wednesday morning. Speakers for this year’s lectures are Dr. Matthew Burdette, curate of the Episcopal Church of the Good Shepherd in Dallas, Texas; Dr. Maurice Lee of Prince of Peace Lutheran Church in Santa Barbara, Calif.; Dr. Mark Mattes of Grand View University in Des Moines, Iowa; Dr. Orrey McFarland of Grace Lutheran Church in Thornville, Ohio, and Dr. Kathryn Schifferdecker of Luther Seminary in St. Paul, Minn. Registration fee for the theological lectures is $125 and includes lunch on Wednesday. “God is Our Refuge and Strength” is the theme of the Women of the NALC Annual Gathering on Tuesday, Aug. 14, from 9 a.m. to 5 p.m. The featured speaker is Pastor Pamela Thorson of House of Prayer Lutheran Church in Elizabethtown, Ky., and Dean of the Heartland Mission District. The $80 registration fee includes lunch.